"How you invest your savings might just be the single most important determinant of your carbon footprint." But to the team of advisors at Canadian sustainable investment firm CoPower, the study left out a critical component of an individual’s personal decisions - how we invest our money. When they dug a little deeper, they were shocked to discover that the average investor does more climate damage with their investment portfolio than they do with all other actions in their daily lives combined. And the climate impacts of our investments are not limited to only well-off individuals like Jamie and Leslie. According to CoPower, an investment of just $10,000 in the Toronto Stock Exchange index has an annual carbon footprint of 800 kg CO2** - equivalent to driving 1900 miles in a car, tumble-drying 332 loads of laundry, or eating 264 quarter-pound hamburgers. ‍"Most people won't be shocked to learn that their investment portfolios are in part funding oil, gas and other carbon intensive projects, but they will be to learn the extent of the impact those investments are having on the climate," Toby Heaps, CEO of Corporate Knights. ‍The upside of all this is that unlike the major life decision of whether or not to have children (which for many of us might be too late! ), factoring climate change into our investment decisions is a powerful and relatively simple way to do better. 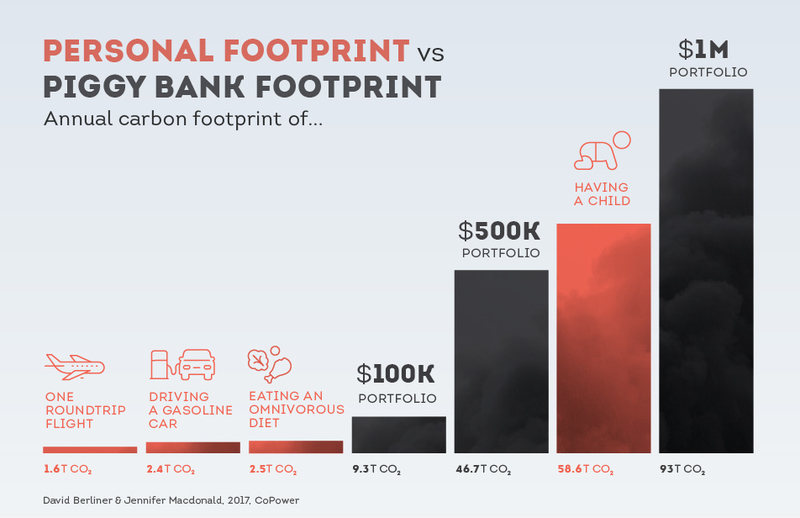 By transferring even just a portion of their investments to a fossil-free fund, the average person could shrink their carbon footprint significantly. 1. Understand your carbon impact. Tools like Fossil Free Funds help you look up the carbon impact of your mutual fund and Decarbonizer helps you see how your portfolio would perform historically if you removed some of the dirtiest polluters. 2. Learn about impact investing options and take action. Open Impact is a catalogue of impact investing products. 3. Seek help from a Responsible Investment (RI) Certified Advisor or sustainability consultants to provide trustworthy, credible advice on how to divest. 1. The initial study referenced, “The climate mitigation gap: education and government recommendations miss the most effective individual actions” was published by researchers at the University of Lund in July 2017. 2. The personal carbon footprint numbers for our couple, Jamie and Leslie were calculated using: https://www.footprintcalculator.org/. Other personal carbon impact numbers were based on the EPA’s GHG calculator. 3. Our example investment portfolio assumes a 50/50 split between two typical funds, the S&P/TSX Composite Index Fund and the MSCI World Index Fund. The carbon impact of this portfolio was calculated by using the Index Carbon Footprint Metrics and using October 27th, 2017’s spot US to CAD exchange rate of 0.78. 4. The carbon impacts of daily actions found throughout this blog and infographic were drawn from the EPA GHG emissions calculator, the Lund study and the Guardian. Specific numbers for the following actions can be found here: driving, burgers, tumble-drying laundry, an omnivorous diet,flying, having a child, driving a gasoline car.